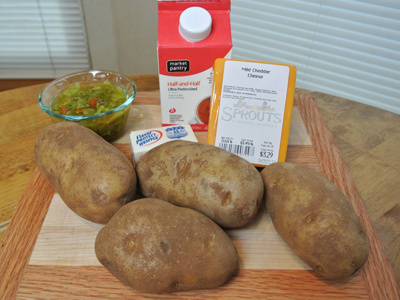 I started with 2 pounds of russet potatoes, a good cheddar cheese (your choice whether it’s mild or sharp), butter, half and half and Hatch green chiles, (roasted and chopped). 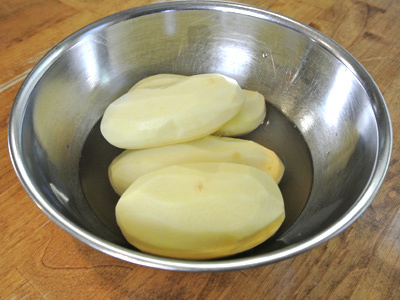 Peel the potatoes, rinse and place in a large bowl. 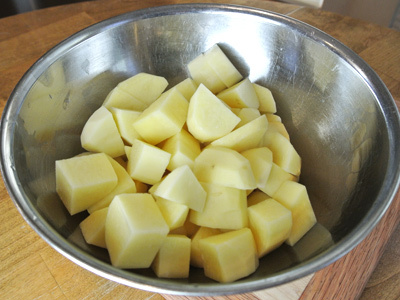 Cut the potatoes into a large dice. Heat a 3 quart heavy bottomed stock pot. Add the potatoes and enough water to cover the potatoes. Bring to a boil over high heat. Continue boiling 25 – 30 minutes. Check the potatoes with a fork for doneness. They should be soft and easily break apart when done. Drain the water from the potatoes. A little side note . . . these were frozen chiles I found at Sprouts which contained a lot of liquid that went into the potatoes. Canned chiles will also have the same effect as these frozen ones. 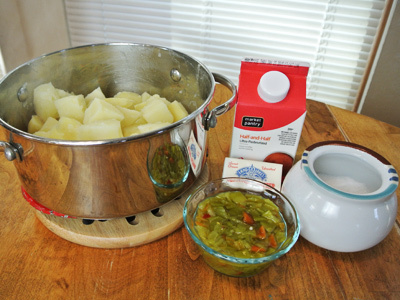 If using fresh chile that you roast and put up yourself, you may need additional liquid (half and half) added to the potatoes or they may be too stiff. Looks like I forgot the cheese in this pic! Add 4 tablespoons of butter which will melt easily in the hot potatoes and then 1/4 cup of half and half. 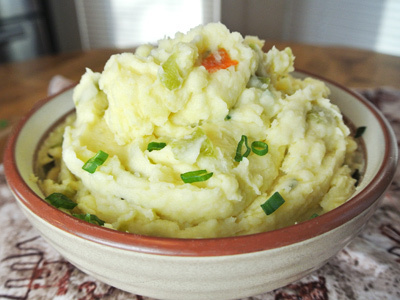 Mash the potatoes until you have a nice smooth texture. I like the old fashioned way of using a potato masher to mash the potatoes. 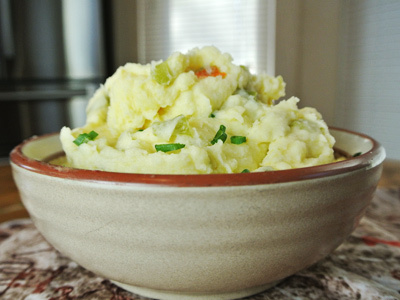 Some may whip their potatoes with a mixer or use a potato ricer for smoother potatoes. I’m just not that picky! Once you have the potatoes mashed to your liking, add in 1 1/2 cups of grated cheddar which will also start to melt as you fold it in. You may want to add more depending on taste. 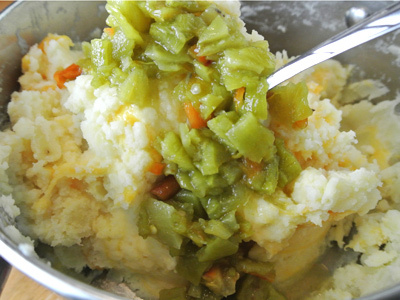 And now for the green chile, add 1/2 cup or 4 frozen Hatch green chiles. Oh, this is making my mouth water all over again!! The cheese melts in so good you can hardly even notice it, but the taste is definitely in there. Fold in the chiles, taste and check the texture. If the potatoes are too thick, add some more half and half. If they are too thin, add a little more cheese. Salt to taste. Peel and dice 2 pounds of russet potatoes. 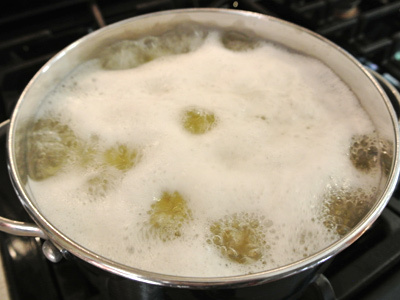 Place potatoes into a heavy bottomed 3 quart stock pot and cover with water. Heat on high until potatoes come to a boil. 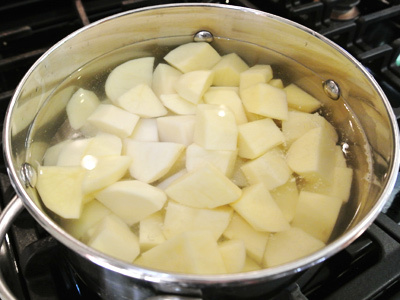 Continue to boil 25 – 30 minutes or until potatoes are soft and easily break apart with a fork. Drain potatoes. Add butter and half and half. 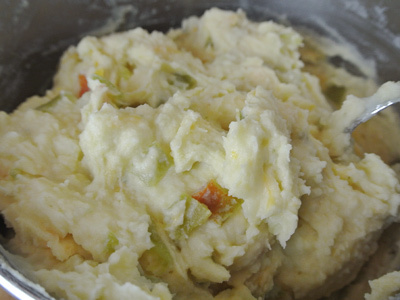 Mash potatoes until all butter has melted and well blended. Add 1 1/2 cups of the grated cheddar cheese and stir while it melts into the potatoes. Add the green chile and fold into the potatoes. Salt to taste. 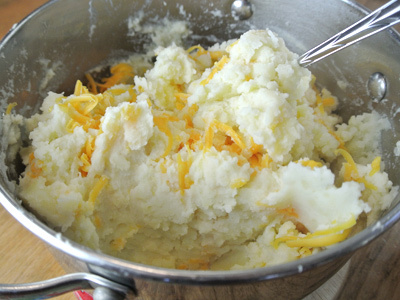 If the texture of the potatoes is to stiff, add additional half and half, if too thin, add additional grated cheddar. These look and sound wonderful. I’ll have to give them a try. Thanks, I hope you will like them as much as we do!